Each spring, a nation-wide high school arts competition is sponsored by the Members of the U.S. House of Representatives. The Congressional Art Competition is an opportunity to recognize and encourage the artistic talent in the nation, as well as in our congressional district. My office looks forward to seeing the work of the talented students who live in my congressional district. All high school students are allowed to compete in the competition. Initiated by Members of the U.S. House of Representatives in 1982, the Annual Congressional Art Competition is an event that allows high school students from all fifty states, the District of Columbia, and U.S. territories to showcase their artistic ability. The winning entry will be displayed in the Cannon Tunnel in the U.S. Capitol for one year. The winner from my congressional district is invited to attend a ceremony in Washington, D.C. to unveil the winning artwork from around the nation. Calling all high school artists! All entries must be delivered to Congressman Luetkemeyer's Jefferson City, Wentzville, or Washington, MO office by 5 p.m. on Tuesday, April 23rd with the student release form attached to the back of the artwork. If you have any additional questions about the Congressional Art Competition, please contact my office at 573-635-7232 or email Laura.Hardecke@mail.house.gov. Courtney Walsch is a student at Linn High School. Hailing from Chamois, Courtney’s artwork was entitled “Freedom.” Her oil painting depicts the Statue of Liberty at sunset. 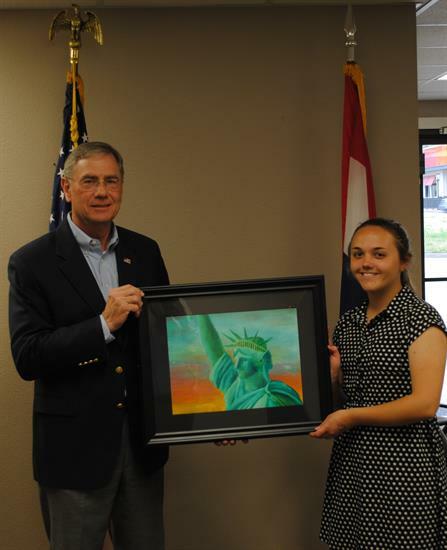 Courtney’s work showcases her incredible artistic skill and patriotism, and Congressman Luetkemeyer was lucky enough to get to congratulate her in person recently.